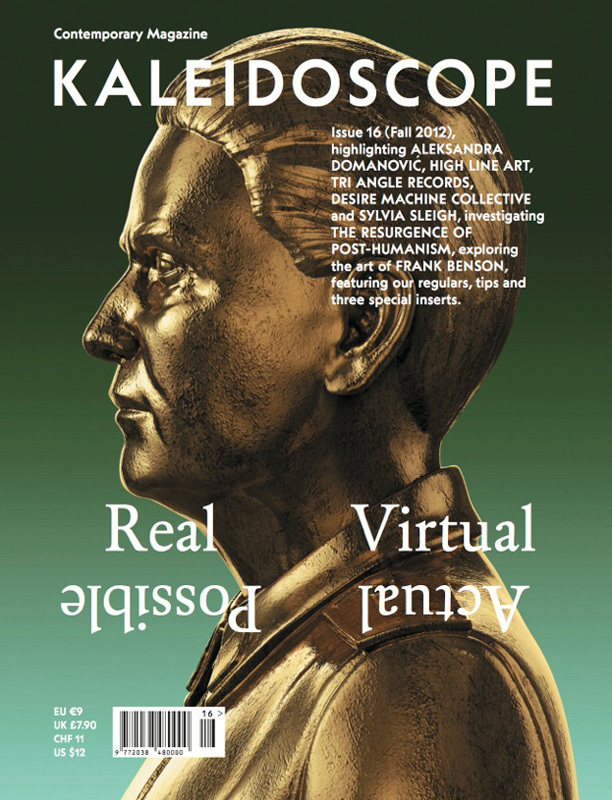 Ruth Saxelby — Textfield, Inc.
At the core of a platform that includes an exhibition space and an independent publishing house, KALEIDOSCOPE is an international quarterly of contemporary art and culture founded in 2009 in Milan. Distributed worldwide on a seasonal basis, it has gained widespread recognition as a trusted and timely guide to the present (but also to the past and possible futures), unique in its interdisciplinary and unconventional approach. 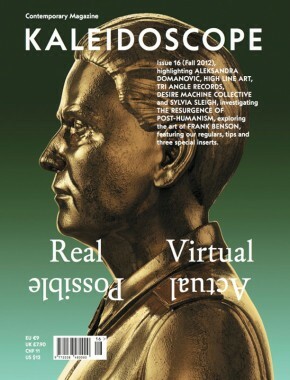 This issue’s opening section features Aleksandra Domanovic, whose videos and sculptures are seen by Pablo Larios as embodiments of the perpetually productive disunion of politics and art; the ambitious public art program of New York’s High Line, described by Piper Marshall as one that confronts artists with many challenges; the record label Tri Angle, whose founder Robin Carolan talks to Ruth Saxelby about how to embody the zeitgeist of electronic music; the Indian duo Desire Machine Collective, who discuss with Sandhini Poddar and Ulrich Baer about mapping an experimental history of colonization; and American painter Sylvia Sleigh, whose elusive politics is contrasted by Joanna Fiduccia to the detailed realism of her portraits. 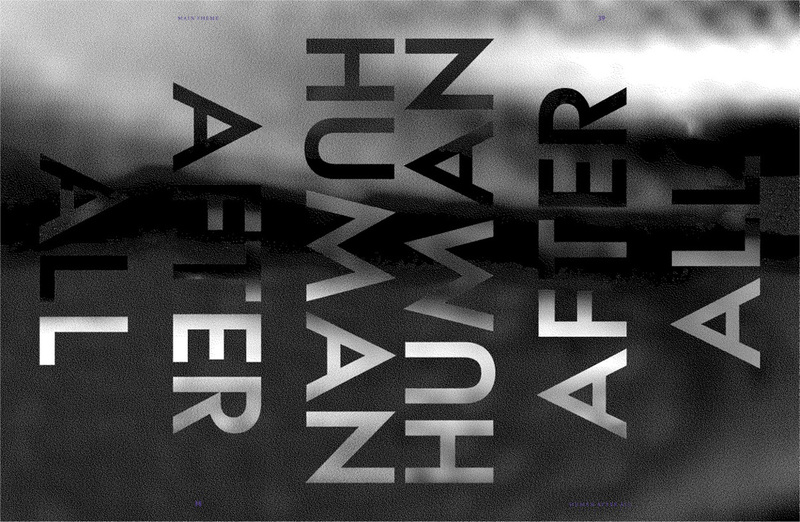 The blend of cybernetics and underground culture realized in the symbolic and mythological repertoire of Cyberpunk continues to inspire sci-fi narratives and permeate the arts, reinforcing its status as a powerful aesthetic. 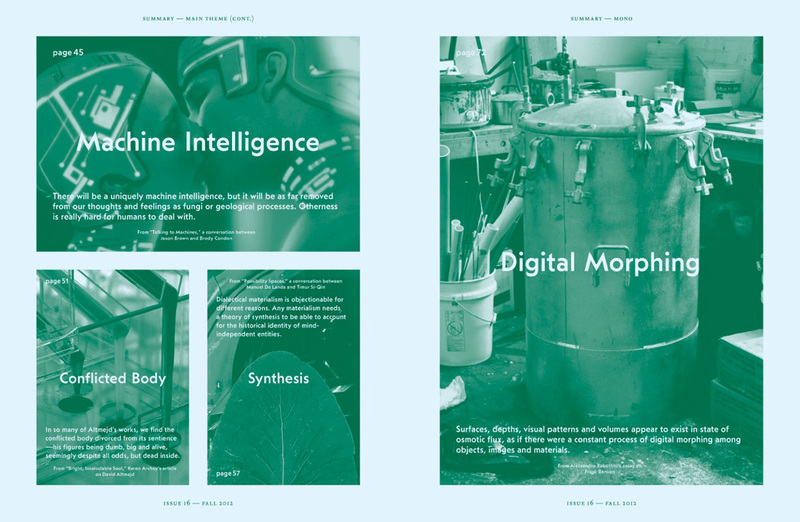 This issue examines the emergence of an art that addresses the processes of mechanization, desexualisation and reification of the human body, and how they relate to questions of identity, morality and fantasy. 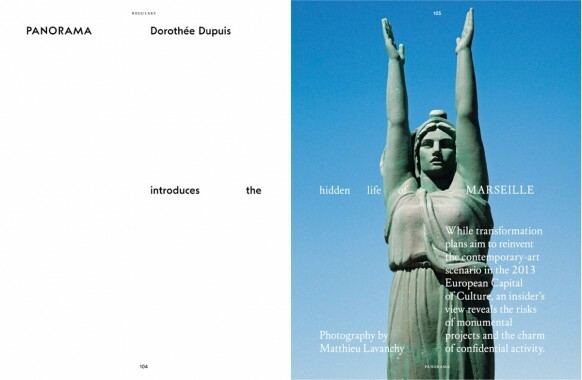 Featured contributions include Michele D’Aurizio’s overview of the work of a new generation of artists; Karen Archey’s analysis of the work of Canadian artist David Altmejd; a discussion between Brody Condon and Jason Brown coordinated by DIS magazine; and a conversation between young artist Timur Si-Qin and influential philosopher Manuel De Landa. 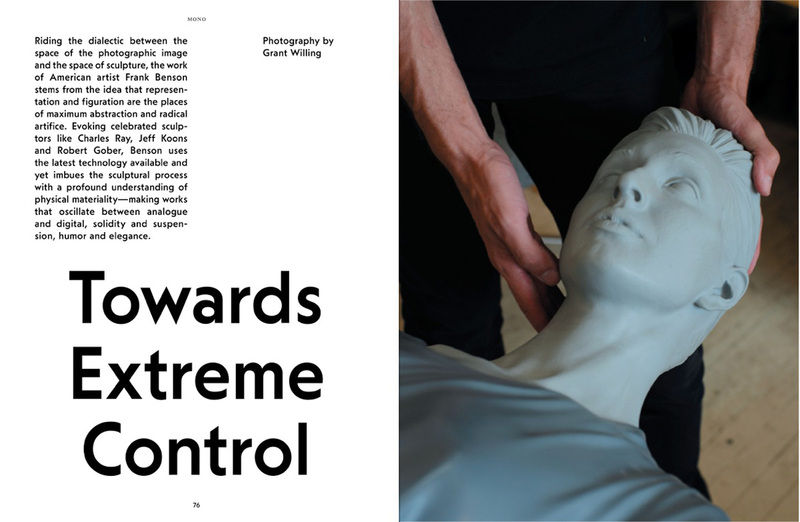 Comprising an essay by Alessandro Rabottini, an interview by Matt Keegan and a photographic portrait by Grant Willing, this issue’s MONO is devoted to American artist Frank Benson, whose work rides the dialectic between the space of the photographic image and the space of sculpture. Evoking celebrated artists like Charles Ray, Jeff Koons and Robert Gober, Benson uses the latest technology available and yet imbues the sculptural process with a profound understanding of physical materiality — making works that oscillate between analogue and digital, solidity and suspension, humor and elegance. Hans Ulrich Obrist interviews the New York-based provocateur Liz Magic Laser; Dorothée Dupuis introduces the hidden life of Marseille; Luca Cerizza analyzes the emotional topography of Alberto Garutti; and Carson Chan meets the DAAD’s visual arts director Ariane Beyn. 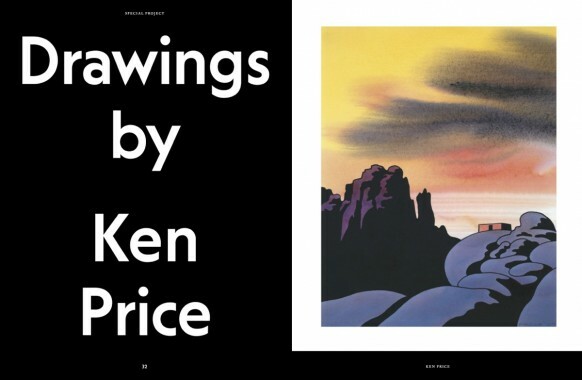 The edition is enriched by our seasonal tips on following, reading, listening, stopping by, meeting and visiting; as well as by three special inserts — drawings by Ken Price, stickers by Alistair Frost and images by Alistair Frost.